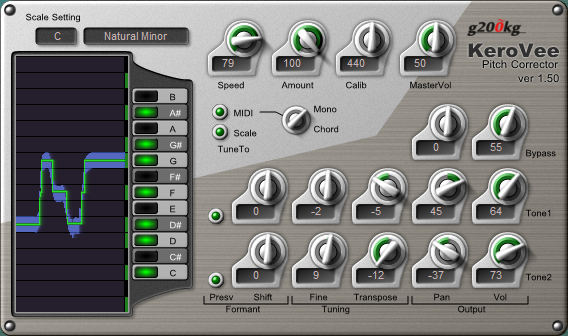 KeroVee is a Pitch-Correction plug-in that works as a VST effect. It can pitch-detect and retune to specified scales or MIDI notes. 'Bypass' and 'SubTone' mix are also available. Scale Buttons 'C' to 'B' specify the 'Allowed' note. Speed: Tuning Speed. Maybe robotic if set to '100=MAX'. - MIDI: Enable Tuning to MIDI notes. - Scale: Enable Tuning to specified scales by scale buttons. Calib: Maste1r tuning 430Hz to 450Hz. The default is 440Hz. - Bal LR balance of output. - Bypass Original sound mix level. - SubTone -1 Octave of tuned sound mix level. - Tuned Tuned sound mix level. Optimized to SSE2. CPU consumption is improved. Latency is reduced for live performance. Enhanced and optimized Graphical User Interface. BugFix: In some HOST (especially Audacity), some noise is generated if invoke KeroVee twice or later. SSE CPU check code is added. message will be displayed if cannot work. Improved tolerability for input level-over. Retune algo is improved, more natural correction.